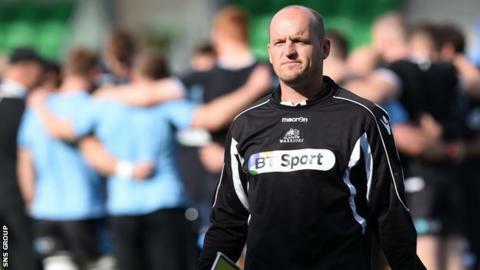 Gregor Townsend hopes to stay on as head coach of Glasgow Warriors after his new contract ends in June 2017. The 42-year-old former Scotland stand-off signed a one-year extension with the Pro12 champions on Thursday. "I'll have been here five years at the end of the contract and my hope is that I continue here," said Townsend. "But I'll be reflecting this time next year whether I'm the right person for the job, whether the team has continued to improve." Warriors have been on an upward trajectory since Townsend took over in 2012, reaching the semi-finals and final before winning the Pro12 for the first time in successive seasons. "It's great that I'm able to stay here for longer, these first three-and-a-half years have gone by very quickly," he added. "I was honoured and very grateful when I got offered the job and I've loved my time here so far and want it to continue." Named coach of the year twice in his three seasons in the Pro12, Townsend was reluctant to address questions on whether or not other clubs had enquired about his services. "If you want there to be interest you can make interest, when people leave jobs either someone speaks to you or not but my focus was on staying here," he answered. "We've been talking about it for a while with Scottish Rugby and I was keen to add another year." Glasgow are sixth in the Pro12, with three losses in their first eight outings, while Saturday brings a must-win European Champions Cup tie with Scarlets at Scotstoun. Warriors have never reached the knockout phase of the competition and opened with a disappointing home defeat to Northampton. "We have a really good squad and it's a young squad so they should get better and we have the work ethic to improve," added Townsend on the coming challenges. "After that, it's about delivering and making sure we are competitive in the Pro12 and in Europe. "We really need to win four of the five [remaining Pool Three matches] and if we were to lose [against Scarlets] we'd be really up against it."